Taking full advantage of the relaxing day at sea attitude, we awoke at 9:00 AM local time. We went to breakfast at Le Grille on Deck 8 and enjoyed some fantastic eggs, beautiful grilled vegetables, local fruits, and some nicely fresh brewed iced tea. The weather this day was a bit rough as there were some rainstorms preventing a relaxing day by the pool. We made the most of it though as we joined Les Gaguines in the piano bar for some crafts time. 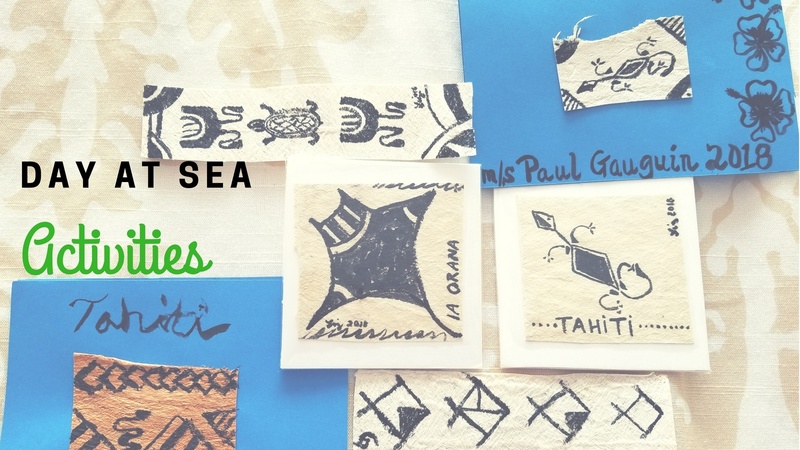 We created our own “tapa” or design which we attached to post cards, bookmarks and finally coasters. This was a great activity to express our inner island artist and for the kids on board to harness their creativity. After we made our creations, we headed to Le Grand Salon to listen in on the port discussion for our upcoming visit to the Cook Islands. 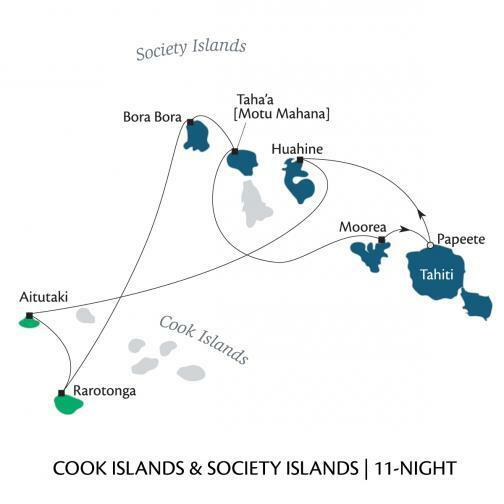 We were going to be visiting Aitutaki and Rarotonga where there are some of the most beautiful beaches, lagoons, and tropical settings you will see on this planet. Then we hung around in Le Grand Salon to observe the cooking demonstration. 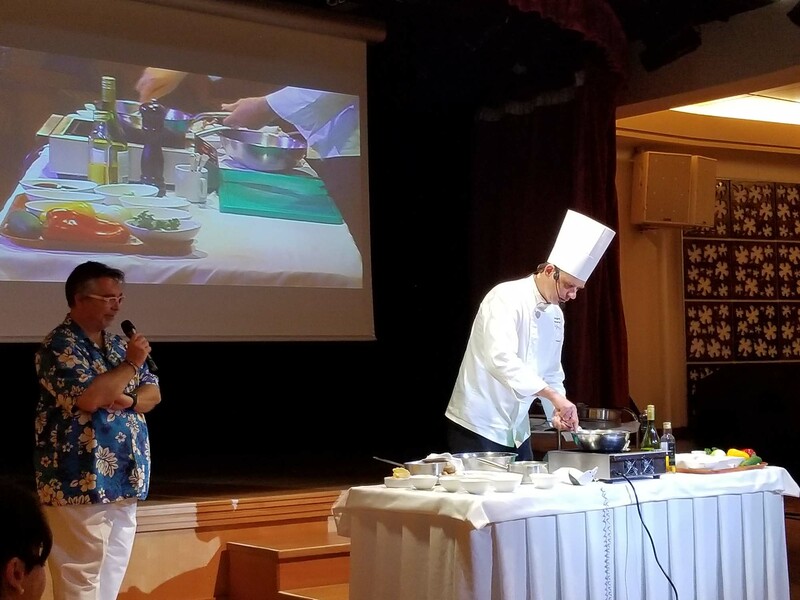 Execuive Chef Stefan Berndt showed us how to make a delicious tuna tartar as well as the perfect mushroom risotto. After a lovely meal and a few tasty desserts (no calories count while you're at sea... at least that's what I tell myself) we headed to Le Grand Salon to learn from the guest lecturer, Pierre Blanchard, about the geology of the islands in the South Pacific. We learned about how these islands are believed to form and how they eventually fade away back into the sea and leave only atolls behind. After the lecture, we tried our listening skills out in a game of “Name That tune” with the ships fantastic pianist, Alex. We were not so successful, but to my defense, they were all songs from before my time. Well maybe, it was also due to the drinks being served as well, drinks (except for very fine wines and some top shelf spirits) are included in your cruise fare on the Gauguin. For the evening meal, we dined in La Veranda where the menu is featured from Michelin rated chef and owner of the Parisian restaurant Apicius, Jean-Pierre Vigato. The food was very good, though the portions were not all that big. I would recommend you order a few things from the menu to get the taste of all the delicious offerings.